The meal I had at Luxbar was one of my top best meals I had in Chicago. The burger I ordered is in top 3 best burgers I ever had in my life, which says a lot because burgers are my favorite food. The menu at Luxbar has everything from breakfast/brunch dishes to lunch food- it has it all and everything is delicious. Luxbar is in a really cute and charming area in downtown Chicago right next to a bunch of bars, restaurants and shopping. A couple people who live in Chicago recommended this place to me, so I definitely had to try a place that was suggested by locals. I went on my last day in Chicago, my last meal before going to the airport, and I’m so glad I went! The weather was perfect so I chose to sit outside so I can people watch and look out on the cute area and streets around the restaurant. We ordered one of my favorite alcoholic drinks for brunch, St. Germain with champagne and a splash of sprite. We then ordered what was about to be one of the best burgers I ever had in my life! You can’t go wrong with this! Light, tender and fresh. Perfect appetizer for lunch on a warm summer day. The pickled green ginger underneath the tuna was amazing too. It had lots of sauce and flavor. Very good! One of the BEST burgers I ever had. Honestly you can’t get better than this. It was pretty much tasted like an IN N’ OUT “double double” on STEROIDS. The cheesiest burger I ever had and if you’ve never had a pretzel bun, you better get on it because it’s amazzeballlls. Like no joke this is the main thing that sets this burger apart from the rest. 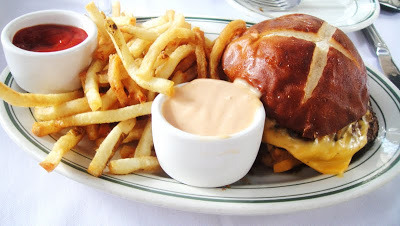 Buns are super important when it comes to burgers, and a pretzel bun is the best bun/breading I’ve had on any burger. It’s money. Luxbar is known for their beef. Our server recommended we get a burger or steak because the meat they use is the highest quality beef you can get. Everything about this burger was perfect- so cheesy, the meat super flavorful along with the satueed grilled onions that added a burst of more great flavor. The meat was perfectly cooked medium rare, and it was super flavorful. The burger was just moist, juicy, cheesy and delicious. The chipotle mayo came on the side which is my favorite sauce too. I mean, how can you get better? Literally OBSESSED. Fries were delicious and perfectly crisp. Everytime I go to Chicago I’m getting this from now on. Nothing more I can say…DONE! Substituted the sesame seed bun w/ a pretzel bun. Like I mentioned above, Luxbar is known for their high quality beef, and you can really taste how amazing it was with this burger. Again, the meat was cooked perfectly and it was so juicy. This burger came with garlic aioli, which is my other favorite sauce lol. The garlic herb cheese added an amazing and unique flavor too. My boyfriend had ordered this one, and he said it was one of the best burgers he’s ever had, and he’s tough to impress when it comes to food…his mom is a chef! So when he gives props to food, you know it’s really good. Both burgers are HIGHLY recommended. I highly recommend Luxbar to all my readers and followers! This place is charming and a happening hotspot spot. Definitely worth checking out while in Chicago, and good for any occasion. My BF and I still can’t stop raving about these two burgers. They really were amazing, and trust me I’m super critical about my burgers…I’m convinced I’ve had the best! Picture taken by me on top of the John Hancock building in downtown Chicago. What a view!